Hi there! 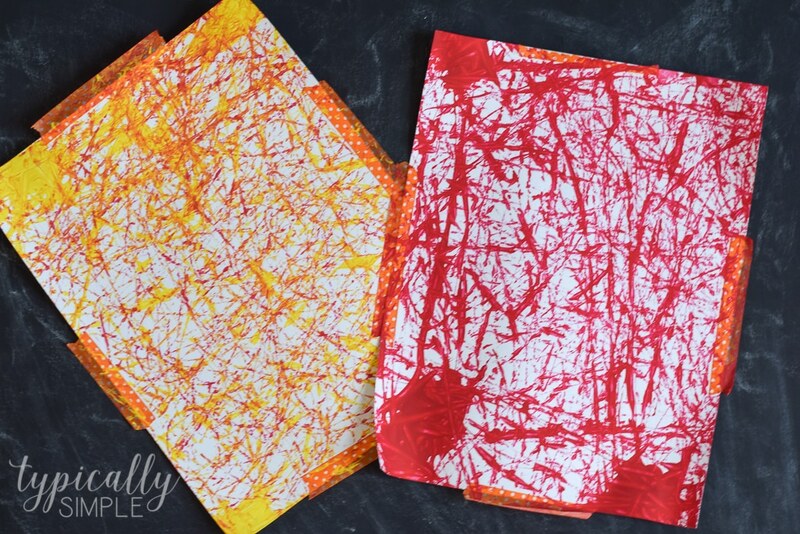 It’s Kelly from Typically Simple and I’m so excited to be here today sharing a fun craft for your kiddos! With summer starting to wind down, I’m always looking for new activities and crafts that will keep my little guy busy and engaged. Painting is usually my go-to craft when we need some downtime from the summer sun, but there’s only so many free draw paintings to be made, especially when most of them end up a lovely shade of brown. Marble painting is a favorite in our house and it’s always so fun to turn the finished artwork into different shapes to hang up. 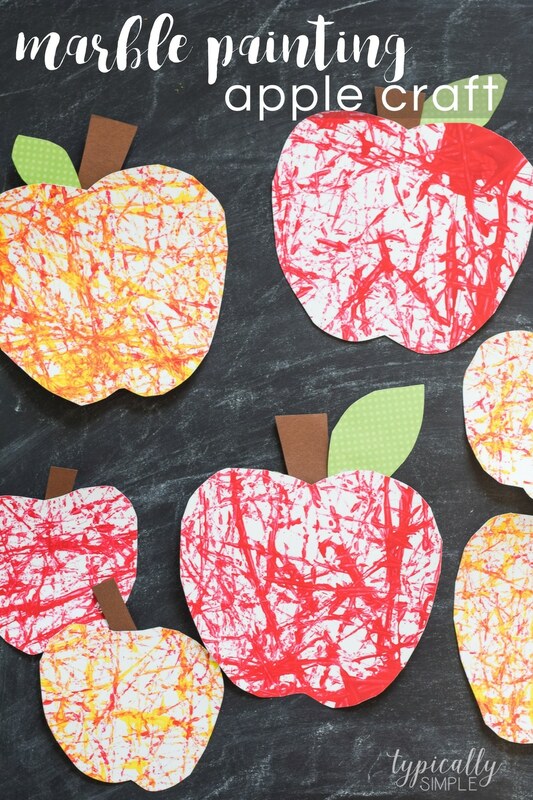 And with fall just around the corner, apple shapes are perfect for this type of painting! Tape all four sides of a piece of paper down on the inside of a box lid. Put a little blob of paint on the edge of the paper. Drop the marbles into the box lid and let the kids shake them back and forth. 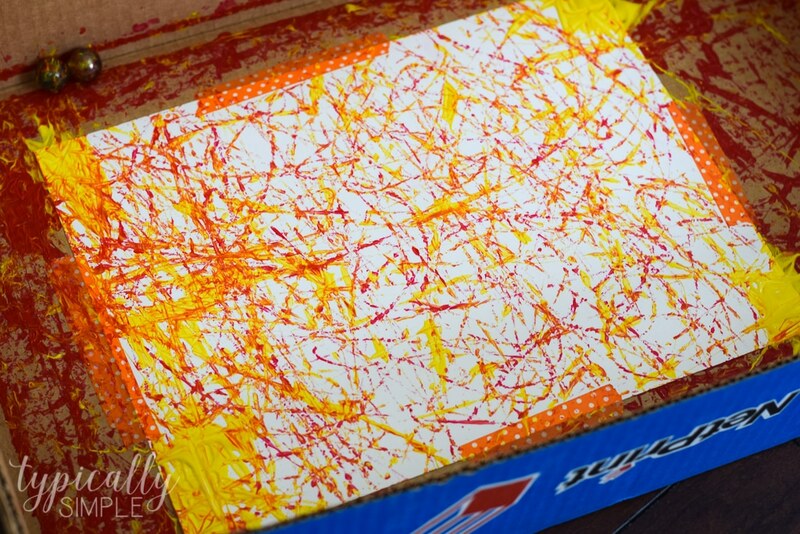 After covering the paper with marble tracks, remove and let dry. Trace apple shapes onto the painted paper and cut out. 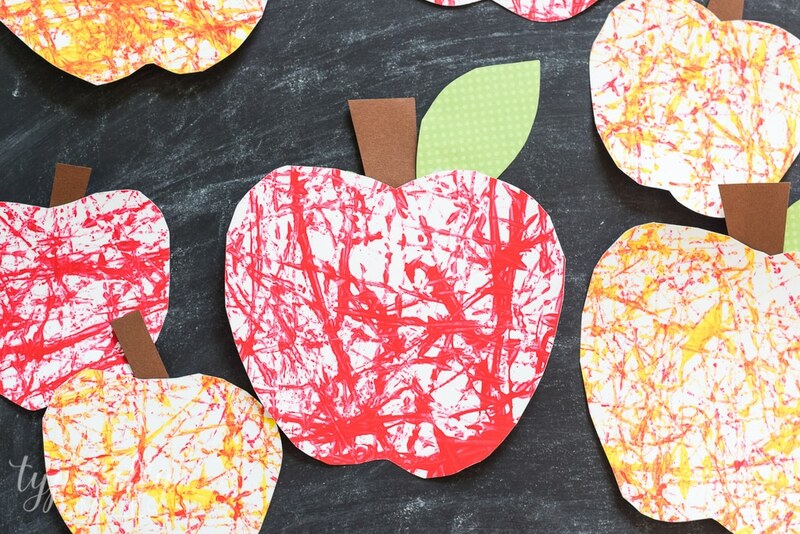 If desired, attach the apples to a different piece of paper and add stems & leaves. I really loved how these marble painted apples turned out! 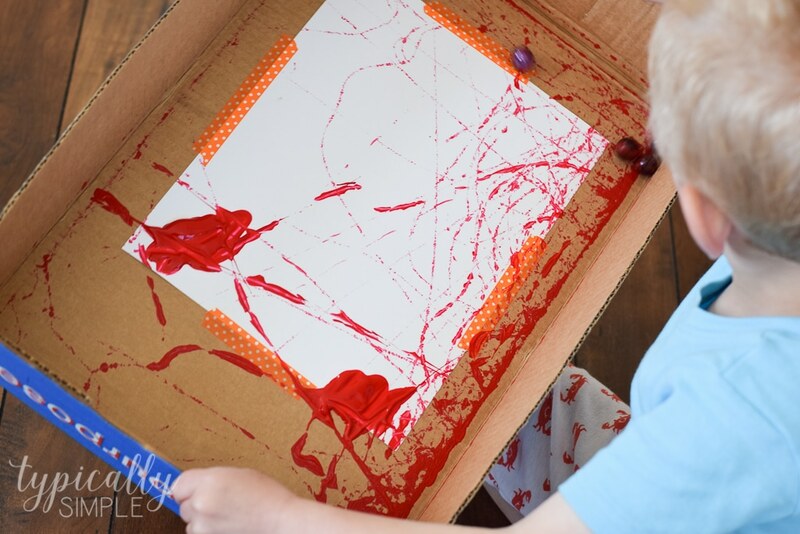 And my little guy had so much fun shaking the box lid around to get the marbles in the paint to make tracks. We did find that it works best by keeping the lid on a flat surface, like the floor or a table, and then sliding it back and forth. There is a little more control over the marbles, especially when making this project with younger kids. Runaway, painted covered marbles can cause quite the mess! You can also find Typically Simple on Facebook, Pinterest, and Instagram. 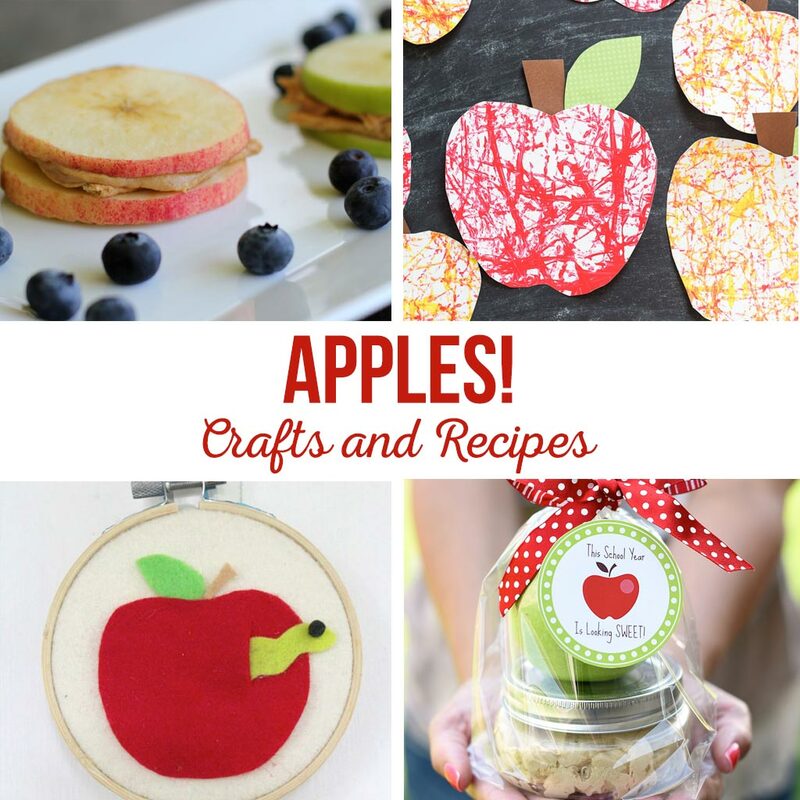 Check this out for more Apple ideas!